An international anti-cancer initiative "Ride4Women" has been staged on Friday for bikers amateurs around 200 kilometers a day. Tank report, the bicycle hike for the fifth consecutive year started this year on July 2 in Tallinn. The cyclists had already stopped in Riga, and on Friday morning – in Kaunas. 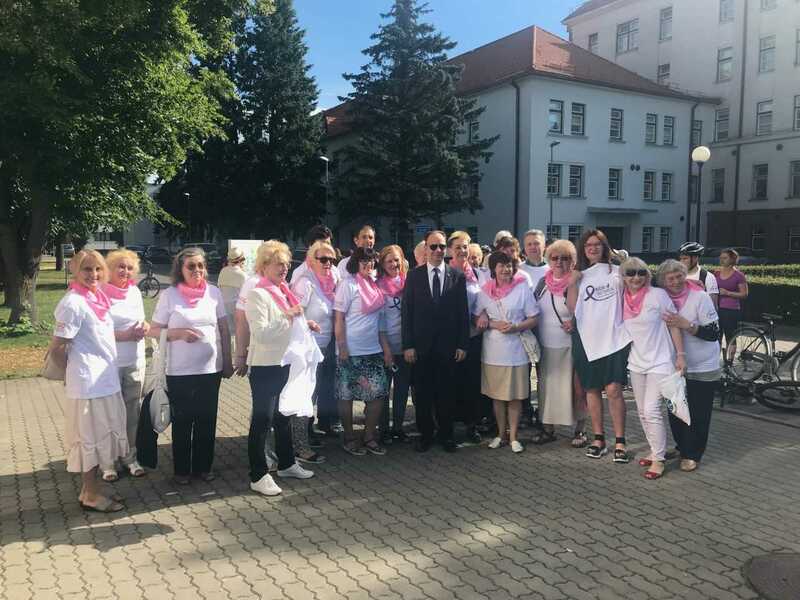 From Kaunas Clinic about 15 Ride4Women cyclists, part of which – every day with cancer treatment doctors – have moved their final destination for this year's journey, Vienna, on the way to the capital Vilnius as well. At the Kaunas Clinic for a further ride "Ride4Women "Aurelijus Veryga, Minister of Health, came on a timetable for a holiday weekend.
" A very beautiful time in Lithuania: celebrating the centenary of our state, the coronation of Mindaugas on the day, the Song Festival takes place. And you decorated this whole beautiful bouquet with something that is no less important than a celebration. You share the message, which is very important. You are civic, active, open, and you encourage the public to take care of your health. I am very pleased that your route has flown through Lithuania. And that you came to Kaunas, where is the heart of the health sciences, "said A. Veryga, pointing out that it would be nice to go at least 5 km of support activities together with the guests of the event, but the festive day obliges us to wear a suit. Having started the cyclist tour from Kaunas to Vilnius, the Minister of Health went to other festive events. Five years ago, the Ride4Women initiative was launched by Oncogynecologist Rene Laky from Austria and his wife Monika Laky . They annually organize long-distance bike rides through different countries. According to Rene and Monika Laky, this year's campaign is aimed at increasing the incidence of cervical cancer, which is one of the four most commonly affected women with cancer. "Lithuania's cervical cancer incidence is one of the highest in Europe. Every day in Lithuania, about 2 women are diagnosed with cervical cancer, every 2 days after it 1 woman dies. Although 93% had early diagnosis and treatment appointment. Cervical cancer cases are curable, "says Laky. For the guests of the event, he wanted to assert that the main thing is preventing the disease – regular visits to doctors and vaccinations. However, even after hearing a positive diagnosis of cervical cancer, if the disease is caught in the early stages, it is almost always cured. R. Prof. Dr. Laky Anthrin and Head of Obstetrics and Gynecology Clinic of the Kaunas Clinics of the Lithuanian University of Health Sciences Hospital. Ruta Jolanta Nadišauskienė. "Knowledge, healthy lifestyles and prophylaxis – a vaccine and regular check-up – is something that can help us catch up with countries where the incidence of cervical cancer is significantly lower than in Lithuania, or almost completely extinct," said Prof. R. Nadišauskienė. She urged the woman not to fear to hear a diagnosis or a vaccine, because the disease is overcome. Ride4Women has been bundled from Kaunas and 5 km of support rides have been invited by everyone who wants to support the international anti-cancer initiative Ride4Women in their actions. Some of the guests of the event came to see only a few dozen people – to go 5 km together with cyclists to Nemunas island, and some bicycle fans dared to go and all 135 km to Vilnius, on the route set up by the Ride4Women team. On July 2nd The Ride4Women bike ride will take about two weeks, the report said. Its team intends to drop 1758 km, with its nine European cities: Tallinn, Riga, Kaunas, Minsk, Lublin, Kelcus, Budapest, Bratislava and Vienna. The European Gynecologists and Oncology Association (ESGO) and Roche, a leading pharmaceutical and diagnostic company focusing on the prevention and treatment of oncological diseases, including cervical cancer, are sponsoring and implementing the Ride4Women initiative. fbq ('init', '969208716473865'); fbq ('track', 'PageView'); . Brief: Iran-US talks may take place "fairly quickly"